Possibly the most famous gate in Monrovia. 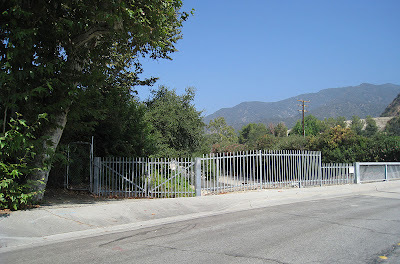 "The Gate" has been referred to in the news lately regarding a lawsuit between the city and homeowners over access to the Sawpit Wash trail. The gate (at the far left of the photo) is expected to come down soon. This is not the gate that started the lawsuit. The gate was removed in 2007. It was located under the bridge. We have asked for a retraction from the Pasadena Star News, but fo date they have not done so. We would like to know where the newspaper got this misinformation.